Recently, after being distracted, my foot slipped off the cement sidewalk and I felt extreme pressure on my ankle. In order not to break or sprain the ankle, I did a combat roll on part of the cement and grass with no injury. The combat roll is not pretty. In fact to many the combat roll looks like a crude adaptation of the rolls they have long been taught. In my experience, however, it might just save you from serious injury. For over 46 years I have done Jujitsu, Judo and Aikido rolls. However, the combat roll for me has its own unique advantage. It allows you to minimize injury if you fall, slip or are pushed directly down (forward) on a hard surface. It also provides you the opportunity to roll and/or counterattack when you do not have the time or luxury of thought. In the sequence shown below I demonstrate this roll after having been pushed from behind. Judo and aikido rolls are somewhat different. They help the person falling roll out of an armbar projection, cork screw, throw or certain wrist locks (sankajo, yonkyu, etc.). 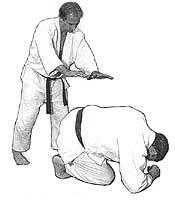 In aikido, for example, the roll is usually an elliptical fall rather than circular. Elliptical falling causes your body to speed up and hit the surface at a different angle. But, because they generate substantial centrifugal forces, the faller's ankles can sustain damage or pain when hitting a hard surface. Modified judo and aikido rolls (no slapping), and just contacting the bottom of your feet and shoulders, result in high pressure contacts. On hard surfaces, this could cause injury to the feet, shoulders and the small of the back. Another often-taught technique in judo and jujitsu is just to fall forward (without a roll) to absorb the fall on your hands, forearms and toes. On hard surfaces this can also cause injury. While these techniques might work for some, I prefer the combat roll when the direction of the fall is directly downward. When using the combat roll, your downward energy is compacted and the tight roll causes a slight flowing impact. One arm (two optional) also protects your head, and by curling into a small circle, you become a small ball close to the hard surface. Thus, centrifugal force on the ankles is minimal. Your hand (palm) is facing the ground to give more support (the arm and elbow are locked). If your palm is facing your head, it is weaker and the elbow may give way or bend, causing your head to contact the cement. The purpose of the arm is to protect your face or head from contacting or hitting the cement. Since you have controlled your fall downward with your leg or legs, your arm should end up near the ground and is only about six inches away from your forehead to provide a safety or give factor. You will roll in a circle over your head, to the flat of the back (not the shoulder), the hips to the bottom of your feet and up to a standing position. I know the combat roll is very different from what most aikido, judo and jujutsu practitioners have been taught, but don't reject it outright. Try it and you will see that is a viable alternative in situations where you find yourself falling directly downward. This article is an edited and enhanced version of one first printed in the American Jujitsu Association's Newsletter, Fall 2001.